The 1950s saw continued expansion in casual consumer photography. Film costs were prohibitive, but newer models with ease-of-use features attracted new buyers. Bulkier, double-lens cameras (the twin-lens reflex model) were still considered the gold-standard for press photographers, but folding cameras had quickly begun to replace box cameras. 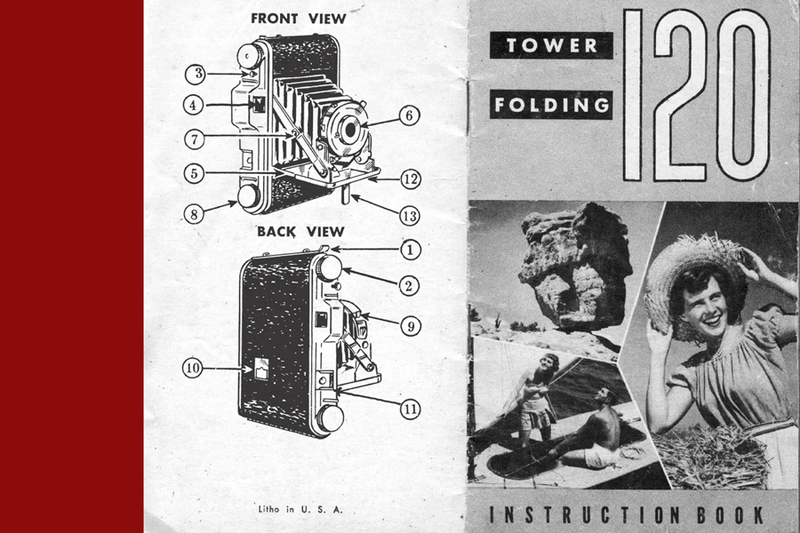 Kodak’s turn-of-the-century innovations – the ‘Brownie’ and ‘Brownie No.2’ – fell out of fashion as cameras such as the 1950s Tower series arrived, manufactured and distributed by Sears, Roebuck & Company. A folding camera is precisely that – a camera with bellows that can be folded down so that it occupies less space when not in use. The self-erecting bed camera has a fixed viewfinder, a simple pre-set lens aperture, and a synchronized shutter. Without having to adjust the aperture, shutter speed, or focal length of the lens, the user literally only has to “point and shoot.” Using medium format 120 film – the most common film size before the transition to 35mm – the Sears & Roebuck Tower produces negatives measuring 6×8 centimeters. Most folding cameras I come into contact with are metal-construction models, although I’ve read that Bakelite models were also used. Metal models are durable and almost always function (so long as they haven’t rusted). Bakelite models, on the other hand, are infinitely less common (most likely because Bakelite plastics become brittle with age). Folding cameras in circulation today usually require some rudimentary maintenance if they’re to be used – torn bellows will leak light into the camera and fog your film. This is easily remedied with a bellows repair kit, or even black gaffers tape or shoe-repair liquid rubber. The beauty of old cameras – of old technology in general – is that they can pretty much be held together with rubber cement & tape and still produce interesting images. Images produced using my personal 1952 model are quite good, especially when you consider how rudimentary this series of cameras is. Images made with these cameras weren’t intended to be enlarged, but rather contact-printed, yielding prints the exact same size as the negative. Because of the fixed lens and lack of adjustable focus, enlarged prints will reveal a lack of sharp focus. The only other downside is the frame-count – you can only get eight exposures from a standard roll of 120 film. Large negatives make for fewer exposures, and there’s just no way around it. In my experience, a limited frame-count usually means that the photographer has an incentive to make every picture count. In the age of digital cameras and smart phones, where we can just delete whatever doesn’t turn out, we wind up making a lot of junk that we have to sift through later on. If nothing else is to be celebrated about the era of film, it forced the camera operator to actually think before they pressed the button.